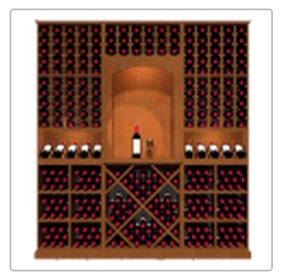 KED stands for Kessick Estate Design, a set of wine rack modular designs created by the people behind Wine Cellar Specialists. 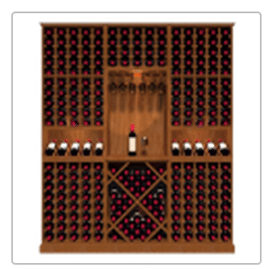 This is a four-group pre-designed wine rack that allows the client to choose the width and wine rack options such as diamond bins, wine glass holders, magnum bottle slots, LED lighting, and others. KED-1 features: glass rack, tabletop, high reveal display row, diamond bins, individual bottle storage, optional lighting, optional side panels, and optional back panel. 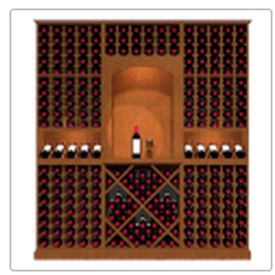 KED-2 features: archway, tabletop, high reveal display row, diamond bins, individual bottle storage, bulk bin and/or case wine storage, optional lighting, optional side panels, and optional back panel. KED-3 features: archway, tabletop, high reveal display row, diamond bins, individual bottle storage, optional lighting, optional side panels, and optional back panel. KED-4 features: archway, glass rack, tabletop, high reveal display row, diamond bins, individual bottle storage, magnum storage, bulk bin and/or case storage, optional lighting, optional side panels, and optional back panel. 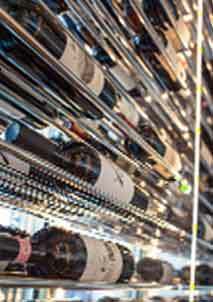 All the wine racks in the KED module are 84.75” high and 12” deep. In each KED group, there are 8 width sizes available. For KED-1, the available widths are: 44, 52, 60, 72, 88, 96, and 108 inches. For KED-2 and KED-3, the available widths are 48, 56, 64, 76, 84, 92, 100, and 112 inches. For KED-4, the available widths are 56, 64, 72, 84, 92, 100, 108, and 120 inches. If the client chooses KED-492, it simply means that the chosen module design group is KED 4 with 92” width. The central module is standard and will expand from the middle outwards, depending on the width preferred by the client. All modules have diamond bins for bulk storage. All have tabletops with designs that vary depending on the KED module. For example, KED 2, 3, and 4 have archways, KED 1 does not. 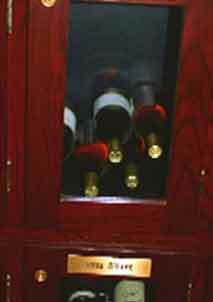 The modular wine rack is made of Sapele mahogany, a wood species that is resistant to moisture and mildew. 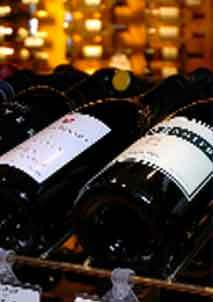 This is a quality material that is durable and can withstand the cool environment inside the wine cellars of Houston, Texas and can carry the weight of the wine bottles. 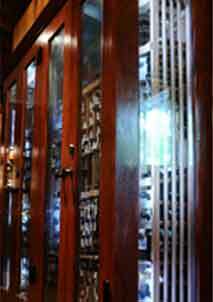 The client can choose options like lacquer finish, LED wine cellar lighting, side panels, and back panel. 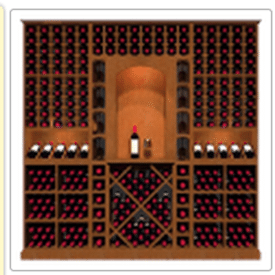 The Kessick modular wine racking system is truly an amazing option as this almost gives the client a free hand in choosing from varied designs and size, depending on the area of his wine cellar and the kinds of wine bottles he collects and stores. The KED modules are shipped fully assembled with a complete installation package. Shipping fee will depend on the destination. 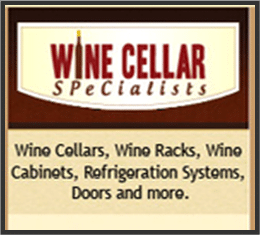 Call Wine Cellar Specialists +1 866 646 7089 for inquiries or click here to request a 3D wine cellar design for FREE!